Liberal Arts – art. college. life. One of the many choices facing high school art students is whether to pursue an art education at an art and design school or at a comprehensive liberal arts institution. There are pros and cons to both. Differences begin with time. Typically art courses at an art and design school take up about 65% of your class time. Liberal arts courses take up the balance, about 35%. The reverse is typically true at a liberal arts college or research university. I’m a bit biased. 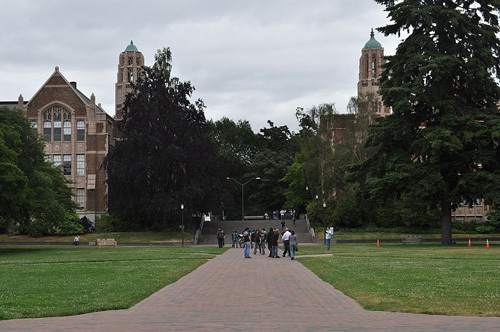 I received a degree from the University of Washington, a wonderful and large state institution in Seattle. (2012 enrollment is over 42,000.) I lived alongside math majors, musicians, social scientists and pre-med students. Fraternities, sororities, “the game” and yucky dorm food were part of my everyday lexicon. OK, you can get the yucky dorm food anywhere – but you get my point. My exposure to the world was diverse and expansive, and I thrived. I was fortunate to have a fellow art major living down the hall from me, but that was just luck. As I’ve stated before, at an art and design college you’ll have the advantage of living with other artists 24/7. That means all the students you interact with see the world creatively – like you do. And, they’re all there to focus the balance of their efforts on their artistic endeavors – like you are. One last element to consider is cost. The expense of four years at college has gone up for everyone – and no institution is immune. Keeping that in mind, many state schools are still less expensive than private colleges. If a private institution is your choice, pay close attention to scholarship opportunities and deadlines. Applying for and winning them could bring down the cost of your education into the “doable” category.